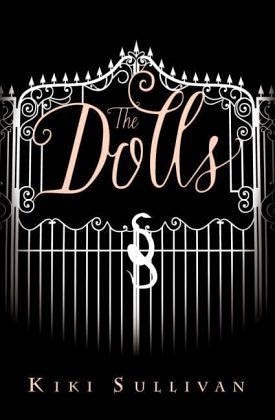 Peregrine Marceau and Chloe St. Pierre are The Dolls. Impossibly beautiful and dangerously powerful, they hold the town of Carrefour under their spell. Girls want to be them. Yet newcomer Eveny Cheval is not so easily swayed by their glamour - until she discovers she is a Doll too. And when a killer sneaks past the locked gates of Carrefour, only the Doll's combined powers can stop the murder in their midst. Sultry, seductive, irresistible... welcome to Carrefour. First thing's first: I wasn't sure I was going to read this. I mean, it sounded interesting, but look at the cover - does it look like something I'd usually read? But a few days later, I decided to push myself out of my comfort zone, and I'm so glad I did. A few days after Eveny Cheval's seventeenth birthday, her aunt suddenly whisks her across the country to Carrefour, a mysterious town you need a key to enter into. When they arrive, everyone acts strangely around her, and it's not long before Eveny realises she isn't entirely normal, after all. She's one of the Dolls - a group which, on the surface, seems to be a group of high school queen bees, but that's not the only intimidating thing about them. They have powers, and someone wants them dead. The Dolls is like nothing I have read before, and it would be a great book for someone wanting to get into the fantasy genre. I don't usually read fantasy, but this seemed to be half contemporary, too, which is much more my style. I was fully invested in the story from the very beginning and the world building is excellent - exploring a brand new magical world is always fun, but even more so when you're doing it with the protagonist who knows just as little as you do. And if you like a bit of romance, well... The Dolls has the perfect love interest, trust me. However, there are parts I found to be very predictable. I guessed who the killer was almost instantly but dismissed it, as always, because it just couldn't be. Whoops. Throughout February Usborne will be releasing six FREE bitesize e-episodes taken from the book, each one accompanied by a video trailer and readers will be encouraged to get involved in #TheDolls conversation online. The first episode is available today, with the last one out on Mardi Gras, Tuesday 17th February. The first video trailer is now live and you can watch it here, and is available for download from Google Play, Amazon, and iBooks. This one sounds like it has a really unique premise. I actually do read a lot of fantasy, so this might work as a backwards gateway, getting me more into contemporary. Glad you liked it and great review! Im glad you enjoyed The Dolls! I read it last year and gave it a 3 or 3.5 stars. I thought it was a good read with lots of creepy scenes.